Today, credit unions have two primary ways of reviewing a loan application: 1) manually via traditional human review, and 2) using machine technology, commonly known as automated decisioning. Many credit unions, large and small, are wary of a change to implement automated decisioning. Larger credit unions tend to be more inclined to engage such technology, while adoption rates at smaller institutions are much lower, for a number of potential reasons which we will address below. In a survey earlier this year Callahan & Associates follows up on a 2016 Callahan study regarding the changing lending strategies surrounding automated-decisioning and loan origination systems (LOS). The lending portfolio has continued its exceptional growth and automated decisioning remains at the forefront of innovation in this area. The U.S. credit union industry saw year-over-year loan growth at 9.7% as of March 2018. This marked the end of 14 consecutive quarters of double-digit annual loan growth. In the past five years, the loan portfolio has expanded 61.8% and balances have topped $982.5 billion. Consumer loans have been the driving factor in overall loan growth, up 20.2% from March 2017 to March 2018. With double digit-annual growth for the past 18 quarters, consumer loans have increased 93.7% in the past five years and first quarter 2018 balances now exceed $487.0 billion for the industry. 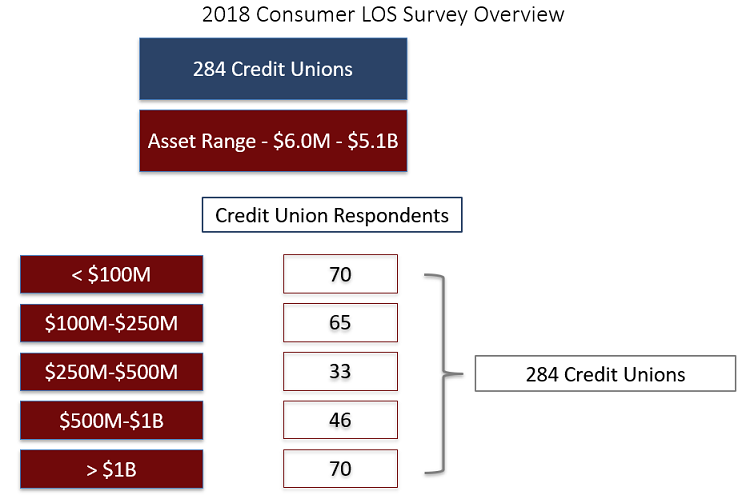 To develop a more thorough understanding of how credit unions are changing their automated decisioning practices amidst the rapid loan growth across the industry, Callahan refreshed the data by administering another survey to participating credit unions in the first quarter of 2018. In total, 284 credit unions of different asset sizes responded to the survey with valuable insights on automated decisioning. Overall, 195 of the respondents reported using automated decisioning for consumer lending while 89 did not. Below are our takeaways from this year’s study. Insight 1: Does asset size affect whether a credit union uses automated decisioning when originating consumer loans? When analyzing asset bands, there is a positive correlation between asset size and the usage of a loan origination system (LOS) for automated decisioning. Only 22.9% of respondents at credit unions below $100 million in assets use automated decisioning. Comparatively, 95.7% of credit unions over $1 billion in assets implement automated decisioning. In fact, the only asset class to have less than 50% of their credit unions using auto-decisioning for consumer loans were credit unions below $100 million in assets. Cost and personnel constraints at smaller credit unions to research, review, and properly implement effective loan origination systems seem the main reasons for their lack of use. As the asset size increases, there is a plateau effect where LOS implementation increases tremendously at smaller asset classes and increases by smaller amounts at larger asset classes. However, there are still credit unions of varying sizes that do and do not implement automated decisioning for different reasons including control, cost, impersonality, and more. Insight 2: What percent of loans are auto approved or denied versus manually approved or denied? Credit unions continue to manually review the majority of their consumer loans according to data collected in the survey. Of the credit unions who responded, on average 69.7% of their loans were reviewed manually and 30.3% reviewed automatically. The composition of automatically decisioned loans were 23.0% auto-approved and 7.3% auto-denied, which equates to a 76.0% approve and 24.0% deny rate within auto-decisioning. *For a large part of the remaining analysis, the median and the middle 50% distributions are used rather than pure averages. With a relatively small sample size, this helps account for outliers in the data that can heavily skew the results. Insight 3: Does automated decisioning negatively affect consumer loan asset quality? The median consumer loan delinquency for credit unions that use automated decisioning was 0.77%. This was 12 basis points higher than the respondents who did not use automated decisioning. At first glance, it appears that credit unions who auto-decision have higher delinquency rates. The whisker box plot highlights the middle 50% distribution of respondents. The middle 50% delinquency distribution for credit unions who utilize auto-decisioning ranges from 0.42% to 1.07%. Comparatively, those who manually reviewed all their loans had a middle 50% delinquency range from 0.37% to 1.52%. Although credit unions with automated decisioning have a higher average delinquency rate, the middle 50% delinquency distribution highlights how the group of credit unions that do auto-decision is both lower and both concentrated than those that do not. The median net charge-off rates for credit unions that use automated-decisioning software was 0.70%, 16 basis points higher than those who did not. Again, the middle 50% net charge-off distribution for credit unions that use automated decisioning is tighter than those who do not, however the upper band of this range is higher than those that do not. Interestingly, of the respondents, credit unions in the largest asset class (over $1 billion) and the smallest asset class (under $100 million) were the only asset classes that posted higher net charge-off rates when using automated decisioning. The three asset classes that segment credit unions between $100 million and $1 billion all saw lower net charge-off rates for those institutions that use automated decisioning. Interested in the full survey results? Contact Callahan today for access. Does automated decisioning negatively affect consumer loan delinquency? Are there correlations between automated decisioning and efficiency, consumer loan origination growth, the loan-to-share ratio, or average member relationship? How often do credit unions evaluate their consumer decisioning criteria? What percentage of loans are automatically approved or denied, compared with manually approved and denied? Who has the biggest market share in the loan origination system market?